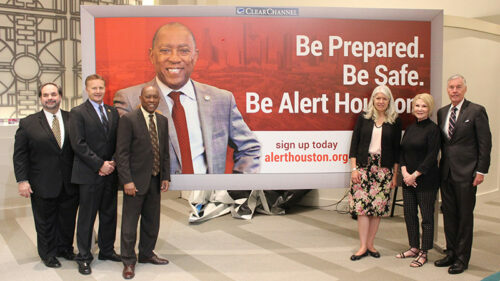 Houston Mayor Sylvester Turner and the Office of Emergency Management (OEM) announced a promotional campaign for AlertHouston, the City’s official emergency notification system. AlertHouston is an important component for the City’s communications to citizens during severe weather or emergencies. Just this past weekend, residents were alerted of severe thunderstorm and tornado warnings through the system. Register at www.alerthouston.org. To promote citizen registration, billboards in English and Spanish have been placed around the City, radio and television commercials will air in English and Spanish, and print and digital advertisements will be produced. Most alerts are geo-targeted, which is crucial for a city as large and expansive as Houston. Residents can register at http://bit.ly/2N7ltYp to receive emergency alerts through email, text message, voice call or mobile app push notifications via the Everbridge system (available in the iTunes or Google Play stores). AlertHouston has grown from an email service to a one that delivers timely, geo-targeted notifications by email, text message, voice call and/or mobile app push notification. More than 133,000 subscribers are now registered in the system, and thanks to a new grant obtained by the Office of Emergency Management, OEM can coordinate with regional partners to fund the system’s first-ever promotional campaign. Supported by a mitigation grant from the Texas Department of Emergency Management, Mayor Turner and the Houston OEM partnered with Ad Impressions, b.ID Creative, and Clear Channel Outdoor to produce the promotional materials. The City of Houston Office of Emergency Management (OEM) is the chief coordinating agency for disaster response in the nation’s fourth-largest City. OEM provides emergency response coordination and communication assistance to City agencies and serves as liaison to regional, state and federal agencies during times of emergency. In addition, OEM engages with the local community to promote emergency preparedness through a variety of initiatives. More information can be found at houstonoem.org.